From 6 until squeak 7:30 squeak p.m. last Fri-squeak-day, Oct. squeak 27 squeak a large lizard, squeak buffalo, and squeak rhinoceros squeak circled outside squeak the Robert Ferst squeak Center for the squeak Arts. These innovative yet impractical monstrosities were not, in fact, Boris, Lizzie, and a new friend from the Rampage series but instead an art exhibit in need of oiling. “The Spirit of the Animals is in the Wheels” was created by Dave Eggers and Juan Martinez as a silvery sheet-metal and mesh approach to the standard tricycle and quadracycle. For most passersby, this experience was merely a random encounter none too strange for a stroll through campus, but for others, it was an unexpected prelude to a night of entertainment within the nearby theater. By 8 p.m., theatergoers were seated and ready for the show to begin. After being duly introduced, Siro-A took the stage in the form of four shiny-white-clad performers and another character who was wearing an outfit inspired by traditional Japanese clothing and had a box for a head. The five wasted little time with introductions and immediately asked for fifty volunteers. The audience was a little confused, but eventually a suitable number of people lined up on stage right. Each was individually photographed in front of the white backdrop in various poses by one of the five while two others directed the traffic. Meanwhile, the remaining group members aimlessly wandered the audience. Occasionally Toshiya Arai would ask “Have you ever seen our show?” or the box head character, who never was introduced or explained, would giggle. At precisely 8:16 p.m., the original line of volunteers had all had their pictures taken, but Siro-A still could not begin their show and instead asked for five more people to be photographed. This lengthy process was not a good opening for something labelled as entertainment. Siro-A could improve their ability to connect with the audience, or they could simply opt to take the necessary photos ahead of time. All of this mostly uninterrupted free time did allow for audience members to read their programs, which revealed that the show consisted of thirteen acts. Upon later reflection, some realized that the photo taking was, in fact, a titled part of the scheduled performance. At 8:18 p.m., “Avatar” ended, and the five performers left the stage with an emphatic “We will see you later!” A little while after this exit, a cameraman with a tripod came out and started filming the audience, displaying his view on the stage’s main screen. This activity became slightly more entertaining when he selected and zoomed in on a single person in the crowd, and onscreen lettering asked him to raise his left hand. Que superimposed flying Superman image. The audience burst out laughing. By this point, the audience was so sufficiently starved for entertainment that a sock puppet singalong would not have been received too poorly. Fortunately, such a travesty was avoided as Siro-A began their performance in earnest with blaring techno music and a three dimensionally projected light show. Throughout the rest of the performance, four artists switched off who was dancing with the light while two others in the background attended to the technology running the show. Throughout the rest of the show, technology was used in innovative ways — not to simply enhance the show as has been done by many performers in recent years but rather as the show itself. At one point, the dancers picked up blank white cards to catch the images of instruments, which they proceeded to pretend to play. “BOX” was among the first acts performed, and it was mostly a feat of synchronicity. The performers were not doing any particularly challenging physical feats, yet their nigh-robotic toying with several blank cubes looked particularly well coordinated as the lighting told a story on them. Perhaps the most enjoyable part of the night, however, were the two sections named “LOGOS” and “Typographer.” In “LOGOS,” the performers contorted themselves along with several props into the outlines of brand logos, including a comparison between the Dove bird and the Twitter bird. “Typographer” played scenes from famous movies with word art scenery, allowing the audience to enjoy and utilize their knowledge of pop culture. Towards the end of the performance, it was shown that the photos which were painstakingly taken at the beginning had been configured into a background for one of the less enticing dances. This act was still interesting to behold, and people do tend to enjoy knowing that they have, in some small way, helped to create a work of art. 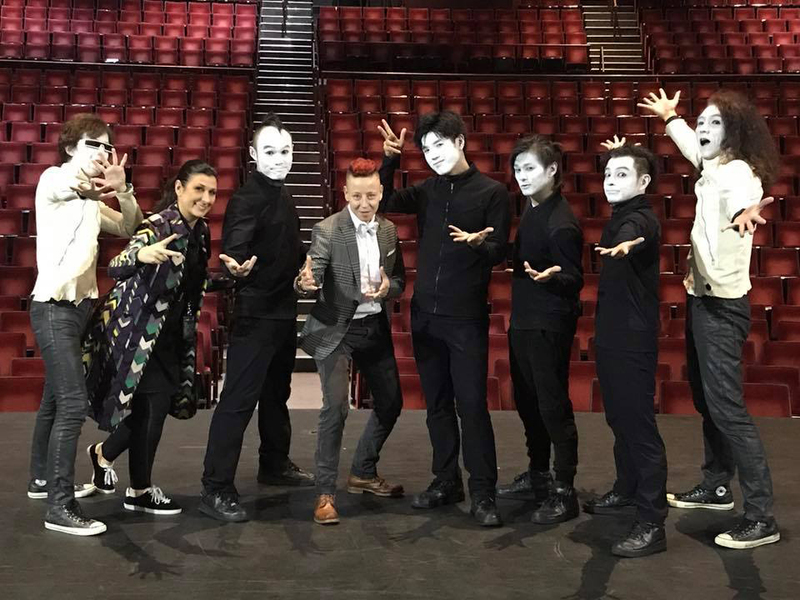 The finale was the epitome of what Siro-A advertises themselves as; the audience was not left wanting as the lasers, lighting and dancing combined for one last hurrah before the contented audience filed out of the theater.